Hockey stick growth. Word-of-mouth. Going viral. Look beyond the jargon and find the stuff of founders’ dreams: the type of explosive growth startups covet. The most celebrated companies are lauded for swift, exponential user growth — a reality that most startups fail to replicate. But the good news is that it’s not the only path. And according to scaling and growth advisor Casey Winters, it’s not even the best one. Winters finds that investors and startups alike often fail to differentiate between the kinds of growth loops that propel products. And choosing the wrong path can lead to a very different outcome: one where user growth and engagement drop off and popularity takes a nosedive. Instead, Winters believes startups should explore a frequently overlooked approach: building a content loop. Winters’ experience leading growth marketing functions at Grubhub and Pinterest has shown that content loops pay dividends. When he joined Grubhub, it was a million-dollar Series A startup with 30,000 users and 15 employees in two markets. By the time he left, his strategy around content and SEO helped turn the online food ordering site into a $10 billion public company with three million users and 1,000 employees. His track record at Pinterest is equally impressive. When Winters joined as a growth marketing manager, the company had 200 people and 40 million active users, but growth was tapering off. The content loop and scaled SEO strategy that Winters and his team introduced helped usher in a second wave of growth, leading to over 200 million users and and a $12 billion valuation. He now draws on these experiences to serve as a scaling advisor for a laundry list of companies, from Eventbrite and Reddit to Thumbtack and Hipcamp. In this exclusive interview, Winters makes the case for driving growth through a content loop, comparing it with other models and walking through how he successfully applied this approach to scale GrubHub and Pinterest in their early days. He outlines what worked and what didn’t, unveiling the 5-step process he followed and sharing three more advanced strategies for the early-stage startup looking to build a plan for steep and sustainable growth. Winters has seen how content loops originate in several startup environments. He got his first taste of success with this growth strategy by working as a SEO specialist at Apartments.com. There he and his team grouped apartment and real estate listings into regional and category-specific landing pages and distributed these curated pages to Google. He adopted a similar tack when he became Grubhub’s first marketing hire by creating landing pages that organized restaurants into regions and types of cuisine, so users could search for Thai food and come across a curated page of local Thai restaurants in the results. 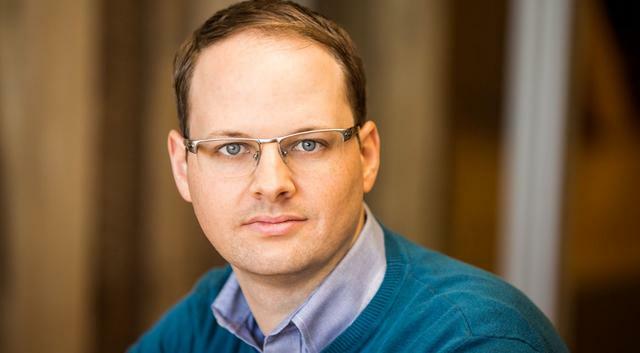 With learnings from Grubhub in hand, Winters applied these techniques again to propel growth in his next role at Pinterest. In the early days, the company grew on top of Facebook’s Open Graph protocol, meaning that every time users pinned something, the content would be distributed to their Facebook feeds for all of their friends to see. Winters set to work, applying his past experiences to investigate growth opportunities in SEO to tackle this challenge. He was happy to discover that, by virtue of how the product worked, Pinterest users were already doing some of the legwork. Users were creating boards full of pins and repinning content from other users that was valuable, culling the Internet for the best content across a wide range of topics. 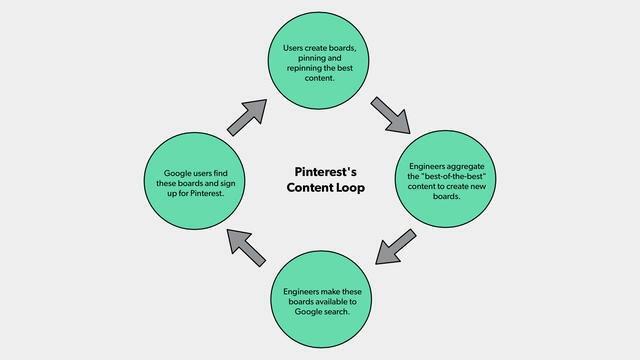 In order to mine this content gold, Winters worked with Pinterest engineers to make users’ boards more searchable on Google, identifying the collections that would rank well. They also created new boards by aggregating the “best-of-the-best” pins and repins, making these new creations available to Google searchers as well, which ranked even higher in the eyes of the algorithms. This is what helped form the second arc of the traffic-generating content loop. Google users found these boards and became Pinterest users who created boards of their own. And the virtuous cycle made another revolution, quickly becoming Pinterest’s primary avenue for attracting new users. Of course, there are limitations to the power of the content model. As Winters points out, neither Pinterest nor Grubhub employees were primarily responsible for driving the content value or volume, as the demand and supply sides of their products took care of it. “If you try to create everything yourself, it’s just going to be hard to compete with a company like Pinterest which now has a 100 billion pins,” he says. 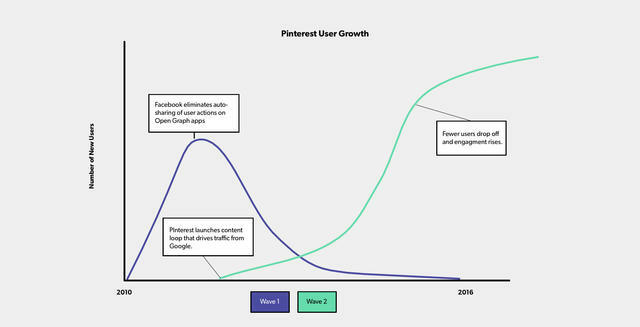 But for Pinterest, the content was just the right mix, and the introduction of this loop unleashed a second wave of growth, which was a much-needed follow-on after the first wave had flattened out following Facebook’s Open Graph platform rules change. The company has since found that this new wave of users still drive significant revenue and have been more active, most likely because they saw the value of Pinterest for discovering content, not just as a platform that has their friends on it. Convert, activate and add some friction to feed the loop. Converting those who see the content is a huge component of the loop. “You need to make it sticky. If people came from Google to Pinterest and didn’t sign up, that's fine, but at the very least they should leave with a better understanding of how Pinterest can help them in the long run. So we were constantly experimenting with ways to unlock that,” says Winters. One of those experiments involved introducing a roadblock. “If you came to Pinterest from a Google search, we would show you a bunch of related pins, but after you started scrolling, it would actually block you from scrolling more until you signed up. It worked very effectively. We threw that thing up as a two day hacky experiment, but kept it,” says Winters. “But if you’ve created value, you can feel comfortable introducing some friction in order to showcase more because it’s the higher quality users who are going to withstand the friction in order to participate." If your growth team has mastered the basics, there are a few extra tips that Winters has for startups seeking more advanced techniques with their content loops. Here, he shares three recommendations that can help companies chart course for the deeper waters of content-driven growth. Experiment to accelerate learning, not to find a silver bullet. The loop won’t be effective if visitors aren’t converted into users that actively engage with a product. And in Winters’ experience, that takes frequent — and failed — experiments. For example, Winters and his team ran an experiment with Google users that skipped the new topic picker during onboarding entirely, instead building a content feed based on the user’s original Google search query. The thinking was that specificity would increase activation rates, but in fact the opposite happened. The query-based feed approach helped users find what they were looking for, but it didn’t encourage them to return to see new content. “They had a great first experience and found precisely what they wanted — they just never came back,” says Winters. Vary strategy and metrics for each segment of the content loop. Content isn’t just about getting people to your product. You have to stop people from landing and leaving. Lean into SEO to build authority and ignite long-term growth. For many teams just getting started, SEO can be an intimidating tactic. It seems competitive, as though you’ll be drowned out by more established competitors with bigger purse strings. But for Winters, it was an essential building block of his scrappy growth strategies. Trust. To build trust with Google search, you’ll need to build up your domain’s authority by increasing the quantity and quality of external links that point to your pages. Solving for trust is the trickier end of the equation, as it largely comes from media mentions. And if you're an early stage startup, typically you're competing with an incumbent that could have decades worth of links pointing to it. “When Grubhub launched in new cities, no one was using us and we had no authority. And Seamless had actually been on the web since 1999. So we had to think of a scalable strategy to get links quickly,” says Winters. Pitch your data. “Startups often don’t realize how the data they’re collecting might be useful for getting press,” Winters says. “How many people are doing this weird trend on your app? That should be a scalable story every month. At Pinterest, we would curate the most popular trends around DIY or weddings on a regular basis and release these ‘what’s hot on Pinterest’ trend stories.” Winters suggests scaling out data-driven stories by geography. For example, a jobs site could write about job trends in different locales and distribute them to local papers. Or take the case of Hipcamp. The campsite-booking site created content about the solar eclipse and distributed these stories to areas in the path of totality, where viewers and die-hard eclipse chasers could see the full show. Local papers in these areas, as well as national publications, picked up their content and linked to it. Funding rounds aren’t even a shoo-in for press these days. There’s something intriguing in every data set. Find it and pitch novel trends to get links back to your site. Winters is bullish on content loops, not only because of their results throughout his career, but because of the issues he’s seen companies bump up against when using other models. Here’s Winters’ rundown on the other growth loops out there, and why they do and don’t work, (a topic he explores further in a growth models course he’s helped develop). Viral loops are the hallmarks of explosive growth, the first thing that comes to mind when startups think of something taking off and catching on. From social media platforms to Slack, some companies are able to tap into something innate that allowed them to grow incredibly quickly. But Winters finds them to be a tough needle to thread. What’s more is that people often attribute other kinds of growth to virality. “A lot of people think a company’s user growth is a viral loop. People will say things like ‘Instagram grew totally virally.’ But is that really true? They also grew because people saw cool photos on their Facebook feed. They saw Instagram’s great content because other people were distributing it in a different channel. In reality, Instagram had both content and viral loops going,” says Winters. Another popular growth strategy involves taking money from a newly signed up user and reinvesting it into ads to attract more users. While paid acquisition may seem to be an attractive strategy for quick growth, when it comes to building sustainable growth loops, it’s important to remember that there are no shortcuts. As Winters points out, many entrepreneurs think that paying for user signups will eventually spark a viral loop. But this kind of growth can mask deeper retention problems that don’t get addressed until it’s too late. Your startup probably won’t fail because you run out of money — it's premature scaling that actually kills you. The sales loop is another popular growth option for companies. When a high-value contract is signed with a customer, the profit is reinvested into growing the sales team, with the idea being that as the sales team expands and learns how to sell more effectively, more contracts will come in at higher conversion rates and customers will become more valuable over time. Similar to paid acquisition, sales loops can also augment other loops. At Grubhub and Pinterest, Winters found that sales outreach to restaurants and advertisers respectively was the most effective method to sign up restaurants to get their menu content, which in turn brought in new users. But sales loops require customers who individually deliver high lifetime value to justify the hefty investment that’s required to hire, train and retain salespeople. That’s why sales loops are ideal for B2B products that carry high price tags and involve long-term contractual relationships. “I’ve seen too many startups jump on the sales train, thinking that’s going to be their growth engine. But if you aren’t meeting a certain price point, then you just don't have enough cash to pay the sales person. You have to have the right systems in place, the right lifetime value and the right order value to be able to justify that model, which not everyone does,” says Winters. Choose your own path to growth by asking these three questions. When evaluating these models, Winters recommends taking a step back. “You need to integrate a growth strategy into the product’s development from the start, and have a plan for retaining users for the long term,” he says. Quick growth may be the focus of every early stage startup, but going viral or using funds to rapidly acquire users might not be the right move. To scale sustainably, layer in different approaches and explore other models, evaluating growth strategies against their ability to help you retain users and monetize in the long-run. If a content loop turns out to be the best path for your product, first identify the kind of content that will be valuable to your users and give them an incentive and a mechanism to share it. Once traffic starts flowing, find the source of your most valuable users, tweaking the product to match their intent and introducing a little friction when they arrive to help with conversion. Patiently run experiments to capture early learnings and focus on the right metrics at every stage of the content loop. Lastly, use SEO as a fire strategy for scaling, reaching out to influencers and pitching your data to earn links that build up authority. Above all, remember that the process of unlocking the right growth strategy takes time and testing, no matter how experienced you are. Photography by Dimitri Otis / DigitalVision / Getty Images.